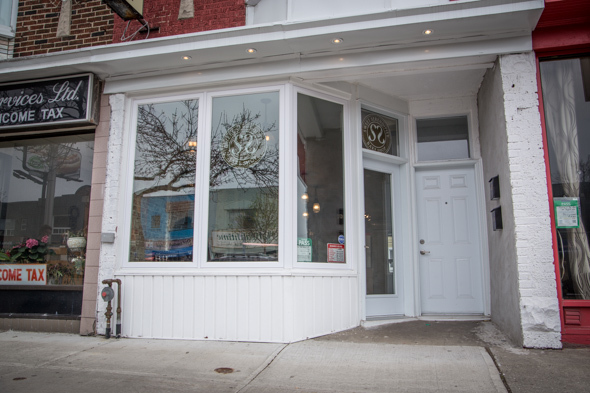 Sweet Serendipity opened its doors on Danforth East just a few weeks ago, and is already cheering up the neighbourhood with its treats. The small shop has just two tables in the front, a display area and cashier and espresso machine in the middle, and the rest of the room dedicated to baking ovens and workspace. You can watch the head baker make the sweets right before your eyes. 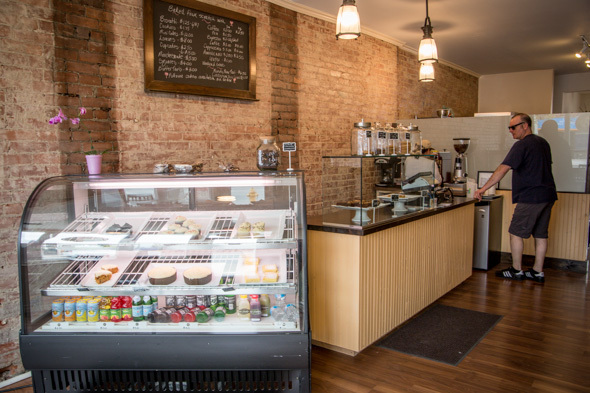 Lines are kept clean and unfussy - the interior features exposed brick, hardwood, and glass display cases showing off cakes, cupcakes and tarts. 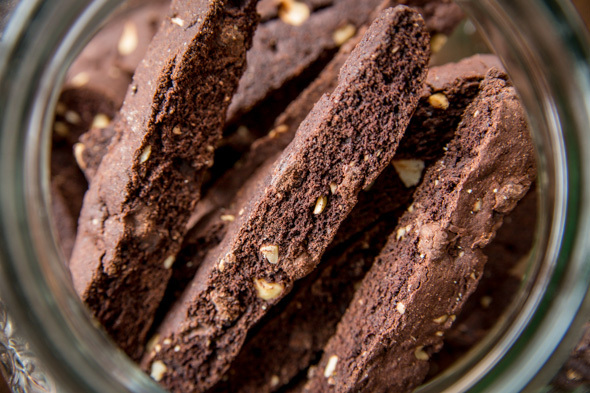 On top sit jars full of biscotti ($1.25 or 6 for $7) and cookies ($1.75), including peanut butter, cranberry oatmeal, double chocolate chip, chunky chocolate flavours. 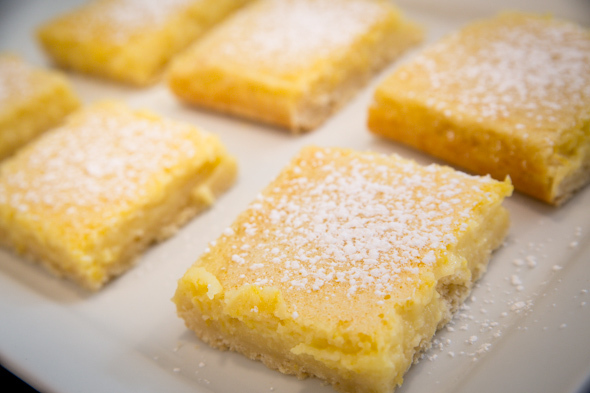 I sunk my teeth into a lemon square ($4), and it was made of perfectly lemon-y custard, tart, not too sweet, with a fine buttery crust. 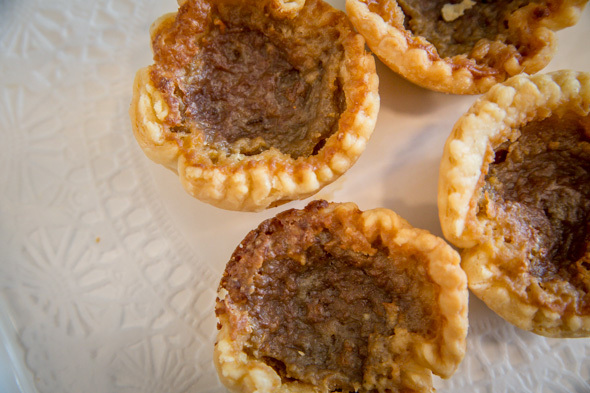 The maple butter tart will give you the required sugar rush for the day ($3), the pastry light and crumbly. Loaves, like lemon or blueberry, are $8. But it seems the forte at Sweet Serendipity is cake - as in cupcakes, and mini cakes and loaves. 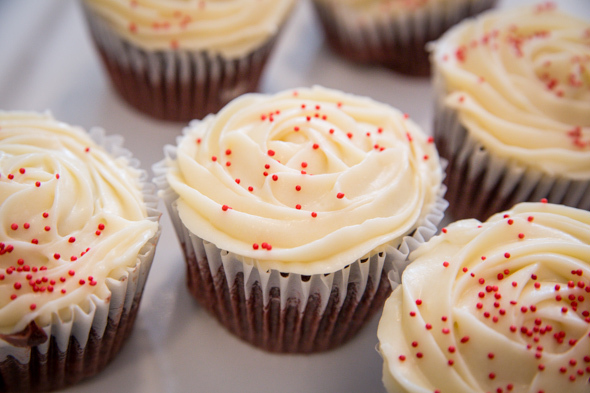 The cupcakes are the fanciest things there, and even they are kept simple - just moist cake (chocolate, red velvet, and vanilla) in little cupcake papers with a happy swirl of buttercream icing on top and a few sprinkles. Not obscene towers of sugar that make your teeth ache just looking at them, but respectable indulgences nonetheless. You can purchase a mini cake (not that mini, actually - the cakes are about 6" in diameter for $12) or just a slice ($3). I found it curious that they don't make their own bread, but bread is a whole other ballgame from cake. Instead they sell St. John's Bakery bread, brought in fresh. That was my general impression, one of conservative production. There wasn't much in the way of abundance - the cases pretty but slightly empty - but I figure it's a new shop in a slow growing area, they are probably just keeping things small and fresh and with an eye on waste. Hopefully as time goes on and foot traffic picks up, there will be need to have the shelves overflowing and the bakery in the back in constant production.